What you'll pay to ride Venice's water buses, and what you need to do before boarding the boats. 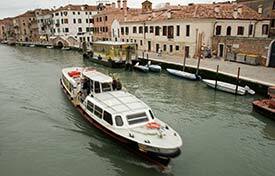 The fares listed on page 2 of this article are for visitors to Venice and its suburbs. Prices for single boat trips are shockingly (some might say "obscenely") high, so consider buying a one- to seven-day Tourist Travel Card, a Venezia Unica pass for long-term visitors and residents if you'll be in the city for a while, or--less desirably--a Venezia Unica pass for tourists. Hold your ticket within 6 cm (about 2.5 inches) of the circular panel for three seconds, or until you see a green light and hear a beep. At some stops, a gate or turnstile will open when you validate your ticket. An ordinary single waterbus ticket is good for 75 minutes in one direction, which means you can transfer as long as you aren't headed back toward your starting point. The Venezia Unica city pass for long-term visitors and residents (formerly imob.venezia) is worth the steep non-resident fee if you're staying in Venice for a while, since it offers huge discounts on public-transportation fares.